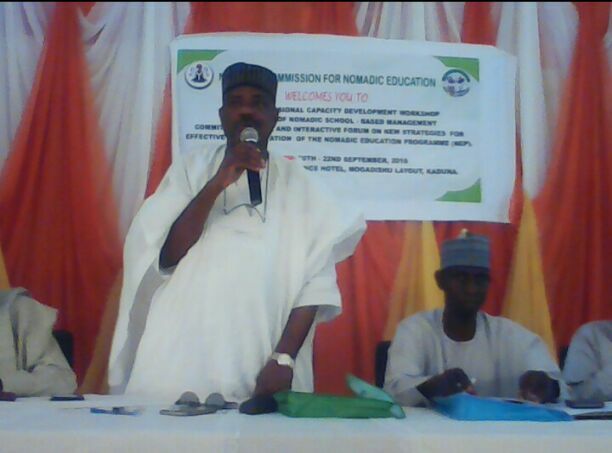 Executive Secretary, National Commission for Nomadic Education, (NCENE), Professor Bashir Haruna Usman, on Tuesday said global experiences has shown that encouraging communities around nomadic schools to get involved in running their schools can make a big difference. The Executive Secretary, who stated this in Kaduna on at the opening of a 3-day capacity building, said the Farmers and Nomads are brothers, and there is no need for the clashes that is being experienced in some part of the country today, calling for dialogue to address all differences. He said, “it can help make a nomadic school more efficient, friendlier and more relevant to what parents, children and the whole community need from education. “Similarly, School Based Management Committees (SBMCs), which are now common features in education reform all over the world, serve as the linkage between the government, the school and the community. They are the channel for bringing resources from the community into the school, and a way of getting a better flow of government resources to schools. SBMCs have become the ‘voice’ of the community in school governance and ownership. “In the same vein, capacity development of all key players in the School Based Management system (pupils, teachers, parents, women groups, religious leaders, community members, NGOs and government) is crucial. “Furthermore, for SBMCs to be more effective, SBMC members will need initial training like the one we are gathered here for and subsequent support from the states, local governments and the civil society. This should help SBMC members listen to everyone from their community; be fair and accountable in decision-making; and enthusiastic and mobilize those who can improve children’s education,” he said. Earlier, the convener of the workshop who is also the Director of the Department of Social Mobilization and Outreach NCNE, Mohammed D. El-Nafaty said, the workshop is aimed at accelerating the achievement of Education or All (EFA) and Sustainable Development Goals (SDGs) and other educational development benchmarks through qualitative teaching and learning in the nation’s nomadic education sub-sector. He further added that the workshop will create a forum for interaction amongst the headquarter staff, members of SBMCs, Zonal Desks officers, extension staff and NGOs representatives and other stakeholders to evolve best approaches and strategies to be adopted to ensure successful implementation of the NEP at the grassroots. Represented at the event by the Commissioner for Education, Professor Andrew Nok, Governor Nasir El-Rufai said, in order to improve enrolment, attendance and community involvement in school governance, the Kaduna State Government has put in place programs to encourage this which include provision of basic infrastructural facilities to improve the teaching and learning environment, provision of water and sanitation facilities in all schools in the state. Speaking on the workshop, the Governor added that it is another testimony of the Commission’s efforts of empowering the communities to acquire practical skills and widen their horizon of seeing governance and educational provision as a collective responsibility.